Avengers: No Road Home #10 Review – AiPT! An incredible finish that’s emotional and beautiful. This tenth issue wraps things up in a glorious way not only closing out the story but celebrating Marvel Comics with some epic art and nods to the greatest comic book publisher on Earth. Real talk, Sean Izaakse is the real deal and then some; from the opening that honors the art of comic book storytelling with panels coming into focus, sketches of the character, and then making him come to life in color, to some vivid eye-catching moments of Vision talking to the villain at hand, this book is filled with excellent collages of heroes filling the page, looking dynamic as hell, and bringing it to Nyx. There’s a double page splash of action, nods to the past, and incredible art. Bravo Izaakse. Color artist Marcio Menyz with Erick Arciniega do well to capture the bright colors of the superheroes on the pages and add nice depth where needed. Vision’s face comes to mind as an extra dynamic due to the colors. This issue is incredibly thought-provoking, especially for a longtime comic book reader. Vision is going up against Nyx in a fight for reality and he does so with words and a clear sense of, ahem, vision. The basis of the story is about creativity coming from positivity, light, and ideas. 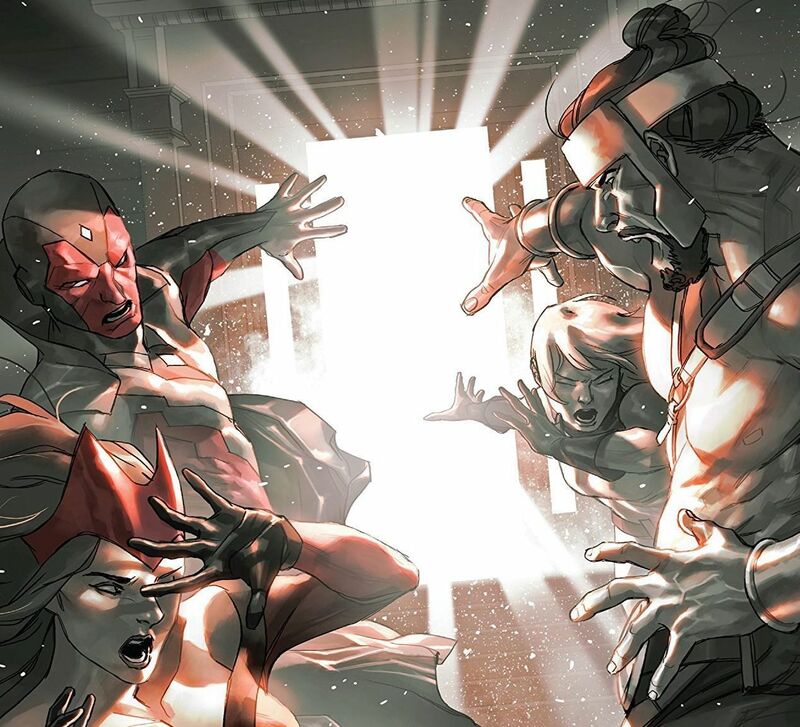 Vision is basically facing off against a villain made of darkness and he combats her in the best of ways: positivity. Al Ewing, Jim Zub, and Mark Waid should be commended for making this book simple in its messaging, but complex at the same time. It’s also quite beautiful that Vision, of all the Avengers in this story, shows a great understanding of life. His words are true and well written. This issue also comes with a nice epilogue of sorts following each of the heroes of this narrative. We get reflections, ideas on where they go from here, and buds to new stories for another time. Entertaining stuff. It’s about light vs. dark. This is a fabulous finish, but of course, it still requires you to read the 9 issues before it. As it stands it can be read alone, but the plotting feels like the end and epilogue (as it probably should be) rather than a satisfying story in its own right. Beautifully written and well timed for Marvel’s 80th anniversary this is one of the best finishes to a Marvel event in some time. It feels perfect especially as it features a hero winning with ideas and positivity.